To achieve cost-effectiveness in mass production, the collector structure must feature not only a high stiffness-to-weight ratio, to keep the material content to a minimum, but also be amenable to low-labor manufacturing processes. A number of structural concepts have been proposed, such as steel framework structures with central torque tubes or double V trusses and fiberglass (Kalogirou et al., 1994b). A recent development in this type of collectors is the design and manufacture of the EuroTrough, a new parabolic trough collector, in which an advanced lightweight structure is used to achieve cost-efficient solar power generation (Lupfert et al., 2000; Geyer et al., 2002). Based on environmental test data to date, mirrored glass appears to be the preferred mirror material, although self-adhesive reflective materials with lifetimes of 5-7 years exist in the market. For the EuroTrough collector, a so-called torque-box design has been selected, with less weight and fewer deformations of the collector structure due to dead weight and wind loading than the reference designs (LS-2 torque tube or the LS-3 V truss design, both commercial in the Californian plants). This reduces torsion and bending of the structure during operation and results in increased optical performance and wind resistance. The weight of the steel structure has been reduced by about 14% as compared to the available design of the LS-3 collector. The central element of the box design is a 12 m long steel space-frame structure having a squared cross-section that holds the support arms for the parabolic mirror facets. The torque box is built out of only four steel parts. This leads to easy manufacturing and decreases the required effort and thus the cost for site assembling. The structural deformation of the new design is considerably less than in the previous design (LS-3), which results in better performance of the collector. Another method for producing lightweight troughs, developed by the author, is with fiberglass (Kalogirou et al., 1994b). For the production of the trough, a mold is required. The trough is in fact a negative copy of the mold. Initially, a layer of fiberglass is laid. Cavities produced with plastic conduits, covered with a second layer of fiberglass at the back of the collector surface, provide reinforcement in the longitudinal and transverse directions to increase rigidity, as shown in Figure 3.15. A tracking mechanism must be reliable and able to follow the sun with a certain degree of accuracy, return the collector to its original position at the end of the day or during the night, and track during periods of intermittent cloud cover. Additionally, tracking mechanisms are used for the protection of collectors, i.e., they turn the collector out of focus to protect it from hazardous environmental and working conditions, such as wind gusts, overheating, and failure of the thermal fluid flow mechanism. The required accuracy of the tracking mechanism depends on the collector acceptance angle. This is described in Section 3.6.3, and the method to determine it experimentally is given in Section 4.3. FIGURE 3.15 Fiberglass parabola details. A tracking mechanism developed by the author (Kalogirou, 1996) uses three light-dependent resistors, which detect the focus, sun-cloud, and day-night conditions and give instruction to a DC motor through a control system to focus the collector, follow approximately the sun path when cloudy conditions exist, and return the collector to the east during night. The system, which was designed to operate with the required tracking accuracy, consists of a small direct current motor that rotates the collector via a speed reduction gearbox. A diagram of the system, together with a table showing the functions of the control system, is presented in Figure 3.16. The system employs three sensors, of which A is installed on the east side of the collector shaded by the frame, whereas the other two (B and C) are installed on the collector frame. Sensor A acts as the "focus" sensor, i.e., it receives direct sunlight only when the collector is focused. As the sun moves, sensor A becomes shaded and the motor turns "on." Sensor B is the "cloud" sensor, and cloud cover is assumed when illumination falls below a certain level. Sensor C is the "daylight" sensor. The condition when all three sensors receive sunlight is translated by the control system as daytime with no cloud passing over the sun and the collector in a focused position. The functions shown in the table of Figure 3.16 are followed provided that sensor C is "on," i.e., it is daytime. FIGURE 3.16 Tracking mechanism, system diagram. setting the adjustable resistor so that for direct sunlight, the appropriate input logic level (i.e., 0) is set. As mentioned previously, the motor of the system is switched on when any of the three LDRs is shaded. Which sensor is activated depends on the amount of shading determined by the value set on the adjustable resistor, i.e., threshold value of radiation required to trigger the relays. Sensor A is always partially shaded. As the shading increases due to the movement of the sun, a value is reached that triggers the forward relay, which switches the motor on to turn the collector and therefore re-exposes sensor A. The system also accommodates cloud cover, i.e., when sensor B is not receiving direct sunlight, determined by the value of another adjustable resistor, a timer is automatically connected to the system and this powers the motor every 2 min for about 7 s. As a result, the collector follows approximately the sun's path and when the sun reappears the collector is re-focused by the function of sensor A. The system also incorporates two limit switches, the function of which is to stop the motor from going beyond the rotational limits. These are installed on two stops, which restrict the overall rotation of the collector in both directions, east and west. The collector tracks to the west as long as it is daytime. When the sun goes down and sensor C determines that it is night, power is connected to a reverse relay, which changes the motor's polarity and rotates the collector until its motion is restricted by the east limit switch. If there is no sun during the following morning, the timer is used to follow the sun's path as under normal cloudy conditions. The tracking system just described, comprising an electric motor and a gearbox, is for small collectors. For large collectors, powerful hydraulic units are required. The tracking system developed for the EuroTrough collector is based on "virtual" tracking. The traditional sun-tracking unit with sensors that detect the position of the sun has been replaced by a system based on calculation of the sun position using a mathematical algorithm. The unit is implemented in the EuroTrough with a 13-bit optical angular encoder (resolution of 0.8 mrad) mechanically coupled to the rotation axis of the collector. By comparing both sun and collector axes positions by an electronic device, an order is sent to the drive system to induce tracking. linear fixed receiver mounted on a tower. A representation of an element of an LFR collector field is shown in Figure 3.18. In this case, large absorbers can be constructed and the absorber does not have to move. The greatest advantage of this type of system is that it uses flat or elastically curved reflectors, which are cheaper than parabolic glass reflectors. Additionally, these are mounted close to the ground, thus minimizing structural requirements. 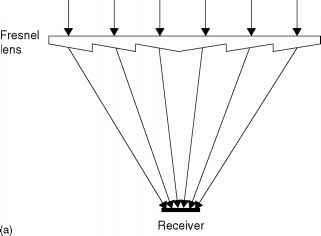 FIGURE 3.18 schematic diagram of a downward-facing receiver illuminated from an LFR field. 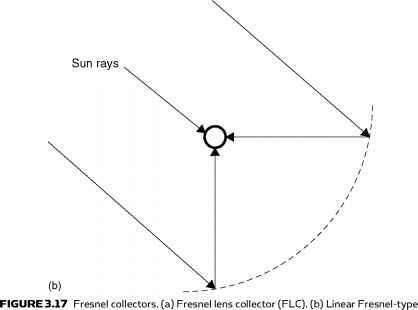 The first to apply this principle was the great solar pioneer Giorgio Francia (1968), who developed both linear and two-axis tracking Fresnel reflector systems at Genoa, Italy, in the 1960s. These systems showed that elevated temperatures could be reached using such systems, but he moved on to two-axis tracking, possibly because advanced selective coatings and secondary optics were not available (Mills, 2001). In 1979, the FMC Corporation produced a detailed project design study for 10 MWe and 100 MWe LFR power plants for the U.S. Department of Energy (DOE). The larger plant would have used a 1.68 km linear cavity absorber mounted on 61m towers. The project, however, was never put into practice, because it ran out of DOE funding (Mills, 2001). A later effort to produce a tracking LFR was made by the Israeli Paz company in the early 1990s by Feuermann and Gordon (1991). This used efficient secondary CPC-like optics and an evacuated tube absorber. FiGURE 3.19 schematic diagram showing interleaving of mirrors in a CLFR with reduced shading between mirrors. by adjacent reflectors and allows high reflector densities and low tower heights to be used. Close spacing of reflectors reduces land usage, but in many cases, as in deserts, this is not a serious issue. The avoidance of large reflector spacing and tower heights is also an important cost issue when the cost of ground preparation, array substructure cost, tower structure cost, steam line thermal losses, and steam line cost are considered. If the technology is to be located in an area with limited land availability, such as in urban areas or next to existing power plants, high array ground coverage can lead to maximum system output for a given ground area (Mills, 2001). 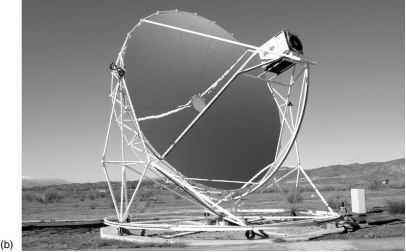 A parabolic dish reflector (PDR), shown schematically in Figure 3.20a, is a point-focus collector that tracks the sun in two axes, concentrating solar energy onto a receiver located at the focal point of the dish. The dish structure must fully track the sun to reflect the beam into the thermal receiver. For this purpose, tracking mechanisms similar to the ones described in the previous section are employed in double, so the collector is tracked in two axes. A photograph of a Eurodish collector is shown in Figure 3.20b. 1. Because they are always pointing at the sun, they are the most efficient of all collector systems. 2. They typically have concentration ratios in the range of 600 to 2000 and thus are highly efficient at thermal-energy absorption and power conversion systems. FIGURE 3.20 Parabolic dish collector. (a) schematic diagram. (b) Photo of a Eurodish collector (from www.psa.es/webeng/instalaciones/discos.html). 3. They are modular collector and receiver units that can function either independently or as part of a larger system of dishes. The main use of this type of concentrator is for parabolic dish engines. A parabolic dish engine system is an electric generator that uses sunlight instead of crude oil or coal to produce electricity. The major parts of a system are the solar dish concentrator and the power conversion unit. More details on this system are given in Chapter 10. FIGURE 3.21 schematic of central receiver system. transfer fluid throughout the collector field raises design issues such as piping layout, pumping requirements, and thermal losses. For extremely high inputs of radiant energy, a multiplicity of flat mirrors, or helio-stats, using altazimuth mounts can be used to reflect their incident direct solar radiation onto a common target, as shown in Figure 3.21. This is called the heliostat field or central receiver collector. By using slightly concave mirror segments on the heliostats, large amounts of thermal energy can be directed into the cavity of a steam generator to produce steam at high temperature and pressure. 1. 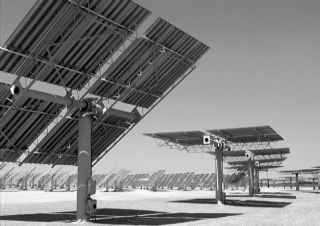 They collect solar energy optically and transfer it to a single receiver, thus minimizing thermal energy transport requirements. 2. They typically achieve concentration ratios of 300 to 1500 and so are highly efficient, both in collecting energy and in converting it to electricity. 3. They can conveniently store thermal energy. 4. They are quite large (generally more than 10 MW) and thus benefit from economies of scale. FIGURE 3.22 Detail of a heliostat. turbine generator, and support equipment, which convert the thermal energy into electricity and supply it to the utility grid. In this case incident sunrays are reflected by large tracking mirrored collectors, which concentrate the energy flux towards radiative-convective heat exchangers, where energy is transferred to a working thermal fluid. After energy collection by the solar system, the conversion of thermal energy to electricity has many similarities with the conventional fossil-fueled thermal power plants (Romero et al., 2002). The collector and receiver systems come in three general configurations. 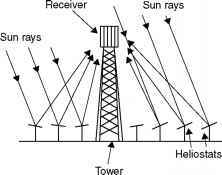 In the first, heliostats completely surround the receiver tower, and the receiver, which is cylindrical, has an exterior heat transfer surface. In the second, the heliostats are located north of the receiver tower (in the Northern Hemisphere), and the receiver has an enclosed heat transfer surface. In the third, the heliostats are located north of the receiver tower, and the receiver, which is a vertical plane, has a north-facing heat transfer surface. More details of these plants are given in Chapter 10. 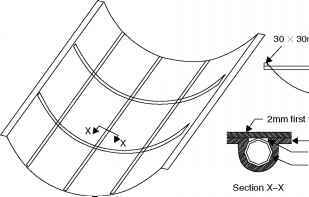 How to fibreglass parabolic trough? What structures are considered parabolas?